I went fly fishing today on Sunday. I awoke at 3.30 am to drive to the river. I’m grateful to my family for giving me a hall pass. The water was super-low but the the trout were decently active now that temperatures have dropped here in New England. Many trees along the river have started to display their pink/orange/yellow autumn colors, and there was a brisk breeze and a bit of rain in the morning. I only saw one other angler and it felt as though I had the whole river to myself. I fished in a rural area, in a canyon. It’s a protected wildlife area and incredibly beautiful. The only sounds you hear all day are the gurgling of the river, the occasional bird, and if I’m lucky, the splashing noises of trout slurping insects from the surface. I really like fly fishing. The more I learn about it, the more I realize there’s more to learn. I’ve been incorporating new techniques this past summer, and I just recently started fly tying. 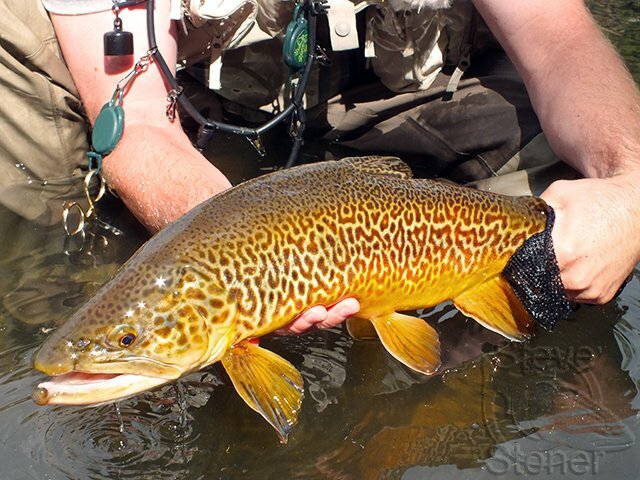 The biggest fish today was a very large tiger trout, its fat belly a blazing orange color. I didn’t take a picture, but above, is what it looked like. A great way to spend the first day of autumn.